I’m MieVee, a work-at-home-mum who relocated from Singapore to Malaysia. My children are Vee (9 years old), Jae (7 years old), and El (5 years old). I’m passionate about education and we’ve been homeschooling from babyhood until kindergarten (about 6 years old). After that, my children attend a local Chinese primary school and we do homeschooling activities after school and during school holidays. From 2009 to 2014, I’ve been sharing Vee’s developmental updates amongst other parenting topics at Mummy’s Reviews™, which has more than 4,100 email subscribers. I’d like to keep Mummy’s Reviews™ focused on baby- and toddler-related topics, and product reviews. For topics related to education and homeschooling, I share them here at Mummy’s Homeschool™, which is owned by Veezian Pte. Ltd. There’re about 4900 subscribers on the email list. In 2018, I became a Certified Accelerated Learning Practitioner so that I can design and facilitate learning programmes with real impact. I’ve also completed an online Montessori Teacher Training course by Karen Tyler. My articles are written based on the courses I’ve attended, my personal reading, observations, discussions with other parents and practical experiences with my children. What I do may not suit you and your children, so do make your own observations and exercise your due diligence. Although I was a very successful product of the Singapore education system, have I found the “secret” to scoring at the top? Maybe. Or perhaps, I was a perfect fit for the traditional schooling environment. Anyway, grades shouldn’t be the focus of education. Life isn’t about acing exams and I want my children to have a well-rounded education. To get out of the rat race. To have big dreams about contributing to the world, and to live those dreams out. Early in my career, I’ve done some part-time teaching — in O-level Math and Chartered Financial Consultant (ChFC) course. Delivering a standard lesson in front of the class certainly isn’t the most effective way to teach a large group of teenagers, let alone energetic young children. That’s why I’ve been on the quest to help others find even more effective and efficient ways to learn. When Vee was 10 months old, I bumped into The Shichida Method. He started class at 14 months old and we’ve been doing home practice ever since. I’ve seen firsthand how amazing whole brain and “right brain” education is. Jae and El started even earlier, when they were in the womb, connecting with me through Shichida prenatal education and joining the older brothers in home practice. In December 2011, I started attending an online Montessori Teacher Training course, and find it an ideal complement to the Shichida Method. When we started, no local preschool was blending whole brain and “right brain” education with the Montessori Method, so I’ve got to design my own, at home. Nowadays, I keep myself updated with the latest research on education and educational psychology. I also have special interests in gifted education, ADHD and dyslexia. Through Mummy’s Homeschool™, I hope to build a community among parents who are passionate about homeschooling or doing after-school activities with their children. 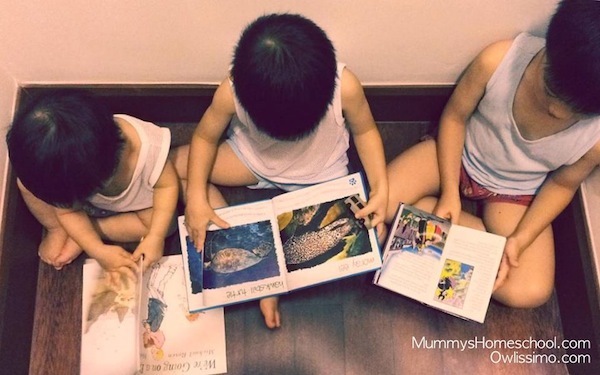 You are welcome to join Mummy’s Homeschool Club and provide your comments on any post. Thanks for dropping by and let’s raise children with BIG dreams!